Wanted to share a little nugget of magic with you, which we discovered whilst in Alnwick at Becca and Simon’s wedding this week. 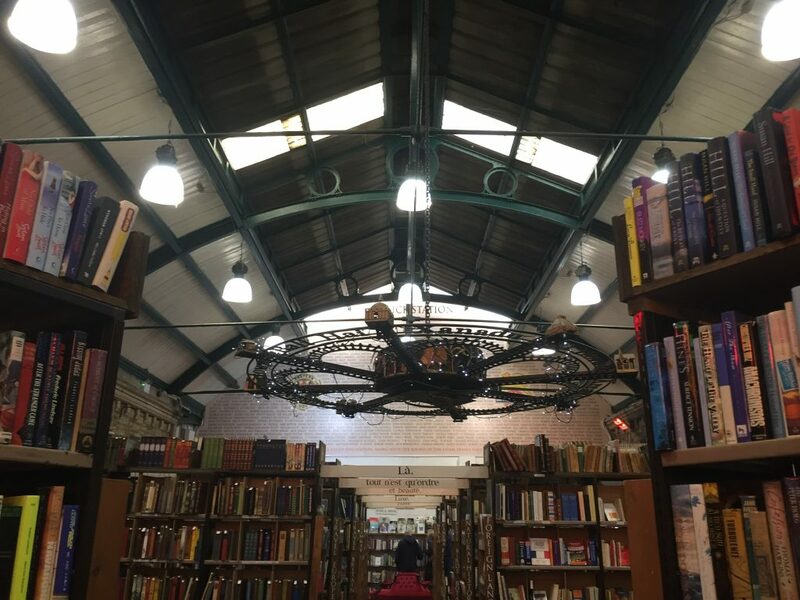 Somebody on Facebook kindly recommended that we search out Barter Books in Alnwick, so we duly did so. AND WHAT A FIND INDEED!!!! 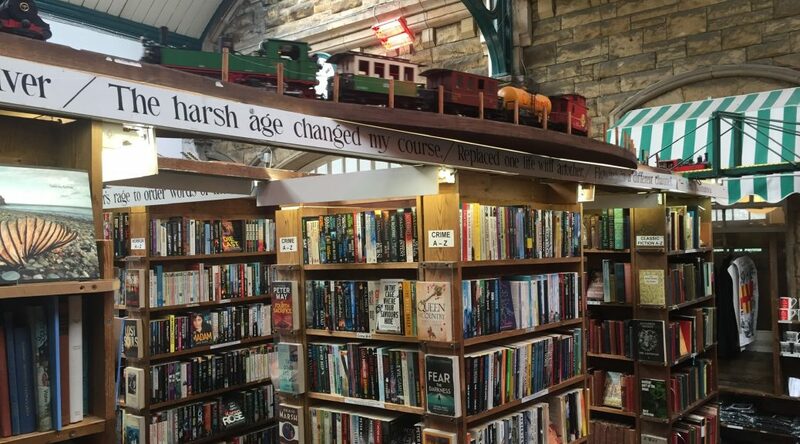 It’s an old Railway Station, converted into a used bookshop. Now, that may not sound overly enticing, BUT. 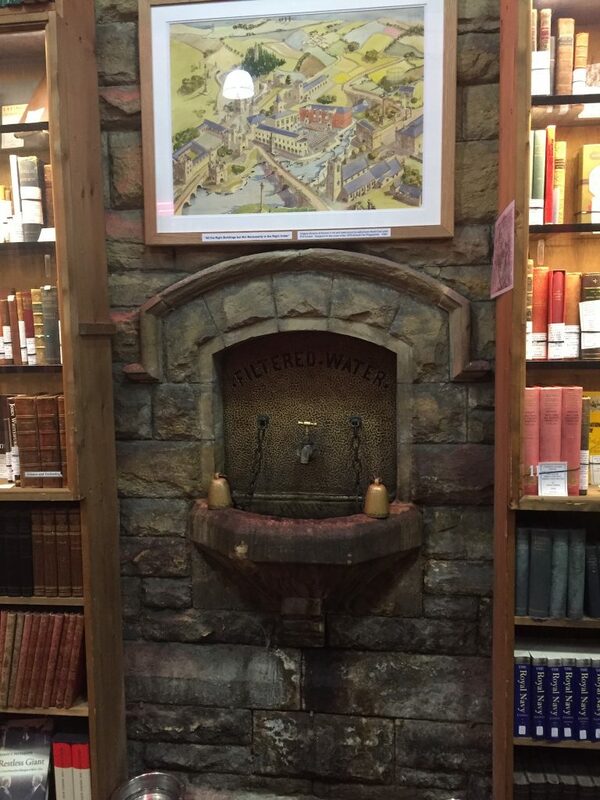 Walk inside and walk into a bookish tardis like no other…. You could happily spend hours and hours, wrapped in these walls lined with knowledge and history and imagination. Dare I confess this? When we walked in, I began to cry. It was like coming home. I realised that I have lost my way. My path was lined with books for so many years! And because of kids and divorce and work and money worries, I wandered off that road. It was not until I was literally surrounded by that old familiar feeling that only BOOKS can give you, that it hit me. Boom. An awakening of the senses. Old familiar poetry and verse echoed in every aisle. Honestly, it took my breath away, and I was transported back into a time in my life when books were my food, my nourishment, my escape to other worlds. You never saw me without a book ! At every turn there was something special, to recall the old train station.. The place got right inside me, right in my soul. And unless I open up that world of books again, proper paper books, I’ll never be right again. How could I have abandoned literature so utterly? When it was my everything! And whilst I may wrap Audible books around my busy life – they will never do for me what the printed word did. And so I must retrain myself, I must sit up straight and not slouch, I must hold a good book in my hands – and apply my brain. How hard can that be? It’s the world I come from! 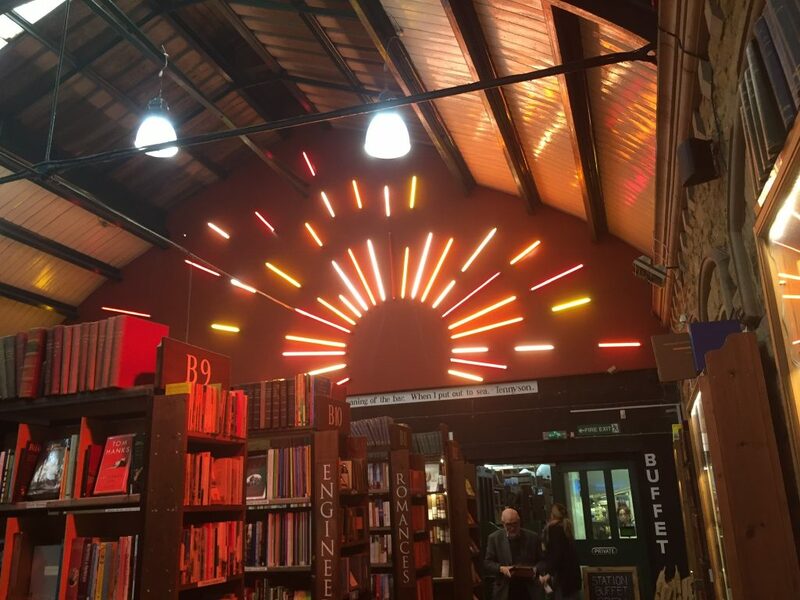 So thank you to the couple who created Barter Books. You have set me back on track. One of my favourite places. I love it in there and they allow dogs in two of the eating rooms. Great food too. Lovely words Barbara , you are a true inspiration. 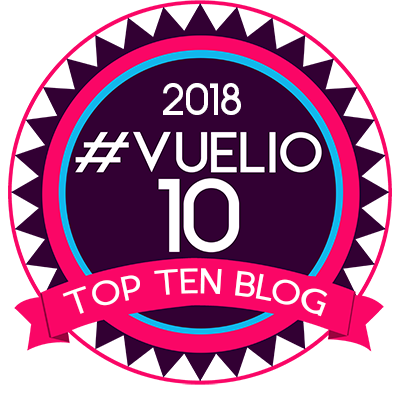 Your blog is always very readable – it teaches me new skills and always makes me reflect . 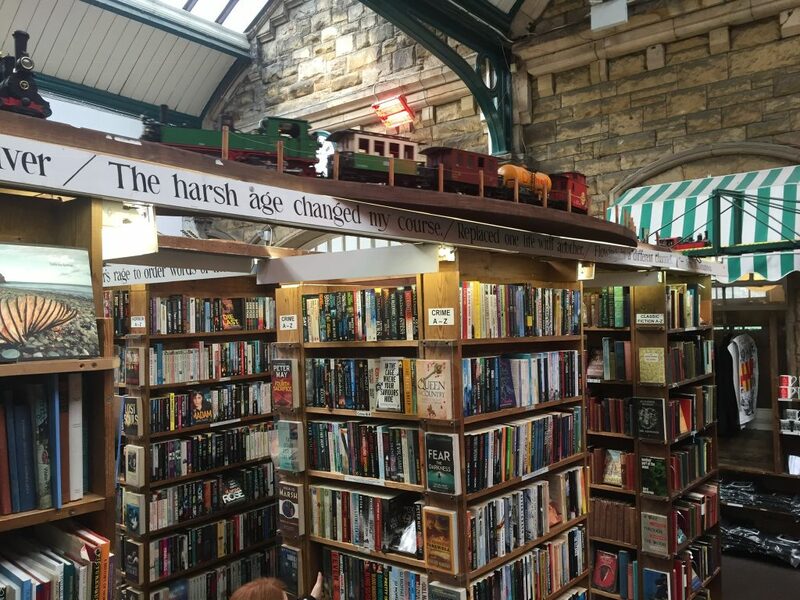 Living in Newcastle upon Tyne, we often call into Alnwick, Barter Books is a gem. I’mclimbing the walls if I don’t have a book to read. What with books and parchment, there’s not a lot of housework being done. Thank goodness my husband is also a gem who is quite happy to lend a hand. So glad you found the beauty of the North East as well. Fantastic place, you could snuggle up all day by a fire with a book. Everyone should visit at least once. That looks a fantastic place, must tell my friend about it, she would be as delighted as you. I m sure you had a wonderful day at the wedding as well. Isn’t it strange the things that send us into tears! My friend has been to that bookshop and says it’s fantastic! Will we see a library appearing in your house or maybe a small part of your craft room to where you can escape to read or craft ! It’s fabulous! I have had an account there for many years, it’s like library that pays you to go… you take in books you no longer want, they ‘buy’ them from you (in credit) you buy a book, it comes off your credit, you take it back and some of it gets credited back! It’s brilliant! And they have hundreds of thousands of them. Oh my…………. I would wander around in there for days – even weeks. It was always my dream to own & run a bookshop – it never happened of course but there is something about a bookshop that makes my soul happy. Always have a book on the go. What an amazing place – I’d be in there for hours! I have a Kindle but purely for the books I want to read that haven’t been published in paperback. The printed style will always win for me! How many did you buy, I wonder! Visited there a few years ago, a very special place for memories of times gone by, before technology took over. What a fantastic looking shop. I have just shown my OH the trains going over the top of the books. I think this may be added to our road trip in September when I plan to make it to Leyburn. Lovely part of the country which we need to explore more. Thanks for sharing. A place I love dearly. I could honestly spend hours in there quite happily. I love that dogs are welcome too. Glad it made you happy! Unfortunately life gets in the way and it takes a ‘lightbulb’ moment to re-awaken us and remind us of what us important. I began to read when I was four and have not been without books since. When I was travelling regularly between Essex and South Wales I had tapes to listen to in the car but nothing beats a proper book to hold in the hands. Ray and I are both avid readers, but whereas he will quite happily read on the Kindle or the lap top I have to have a book in my hands. Unfortunately when we moved we had to reduce our library considerably which broke my heart. However we still have 11 tall book cases downstairs and 4 upstairs on everything from Art and Astronomy to Zentangles and Zoology and many things in between. I read every day but sometimes I get so into a book that I loose all track of time. I would love to go to this bookshop but I know we would both get lost in there. Looking at your pictures brought tears to my eyes too. I think you are on the right track Barbara, enjoy your journey back to the book world. I totally agree Barbara: that bookshop is such an amazing place. I’ve been twice and both times came away with something special. I’ve loved books since the time I was reading a story in which it was raining. I had been so engrossed in the story that I was amazed when I looked up and realised it was a bright, sunny day outside. I was 7! I would recommend a longer trip to Northumberland; it’s a beautiful part of the country. Cor! I can see a section in there that Pete would make a bee line for! We have managed to get windows custom made for our caravan now, so I reckon we have earned a trip! It’s one of my fav places when we are in Northumberland. I always come away with a purchase or 2! I could spend hours in there, it’s truly awesome. Wow! There is nothing like holding a book and turning the pages…….and back again cos you have forgotten what you have just read!!! Fabulous shop, wish I lived closer. Looks like my kind of heaven. There’s nothing like the feel of a book in your hand. E readers just don’t do it for me. I hope you can find time in your very busy life to pick up a book . I have found that crafting has interfered with my reading. Oh wow! What an amazing place and I can well believe your reaction when you went in. We are a family of readers and I cannot imagine being without a book. I can remember my daughter, as a 3 year old, still reading aloud and asking when she would learn to ‘read in her mind’. She hasn’t stopped since. I always find it sad when young people say that reading is boring and wish that they could find a way to enjoy exploring books and using their imagination. I volunteer in a local primary school, listening to 8 year olds read and it is a highlight of my week. Maybe a groove plate book would be nice then Barbara just a thought. For weddings christenings and the like . Maybe a groove plate book would be nice then Barbara just a thought. For weddings christenings and the like . I love books to always have me time in the day and I have to have my book . Oh my what a truly wonderful place. I felt myself welling up just reading your blog and seeing the photos. So nice that all those books that have brought so much joy to others are there to bring joy again. Thank you for sharing. So glad you loved Barter books. One of the top ten bookshops in the world apparently! We are lucky in that we only live an hour’s drive away in Gateshead. We were at a wedding at Alnwick Treehouse last November- magical, isn’t it? Next time you’re in the NE our beautiful beaches, castles and Farne Islands are a must!!! Thank you for sharing this gem with us, what an amazing place. I can just smell all those lovely books. I love having a proper book to read and know I would spend hours there. I think we need to explore this part of the country so will have to booka holiday soon. I sit in house surrounded by books. My late husband and I we great readers. Never quite taken to the kindle. Much rather have the real thing. 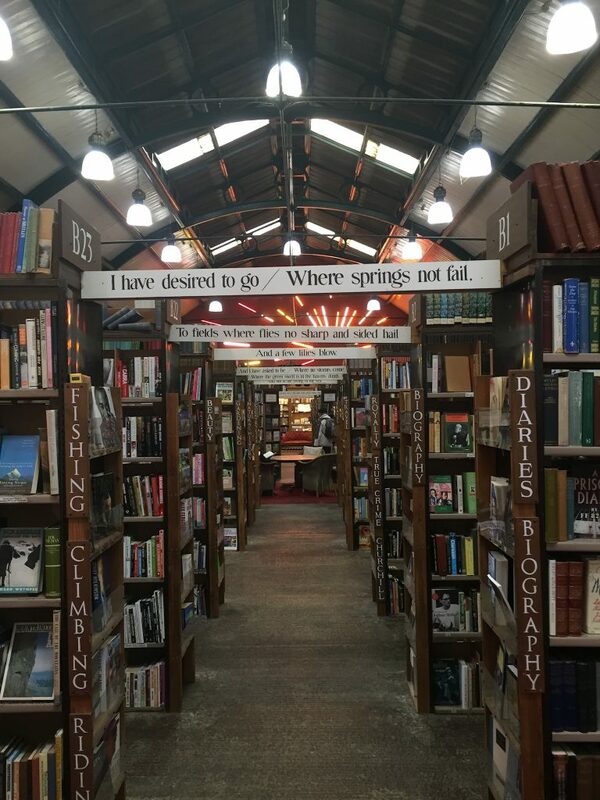 what a fantastic Book Shop, I would spend so much time there. So THAT’S where Heaven lies!! All those books, good food AND dogs allowed. Sadly there are few books I can read now as I can no longer see to read books in fine print, so I rely on my Kindle which I read all the time, and I refer constantly to my reference books and get lost for a happy hour or two in Brewer’s Phrase and Fable and others!! Wish we had a similar shop ‘darn sarff’ !! How lovely to find a good old fashioned book shop and what a great way of using the old building. There is a similar one near Bakewell but it doesn’t have a train running round and it’s not quite that big. If I,m ever that way I will certainly pay them a visit. Wow what an amazing place. There is a second hand bookshop at Dagfields Antiques Centre near Nantwich which has the same feeling. It is smaller but the feeling of being cocooned in books is wonderful. The owner is an Everton fan so we get to combine love of books and footie in conversation too. He’s also been known to rustle up a bargain from the ‘to be pulped’ section of badly damaged items. Last time I called round I purchased a hardbound complete portfolio of Beethoven Sonatas. Perfect for art journal and card backgrounds. 15 minutes of DEAR (drop everything and read) at the start of this afternoon’s lessons set me up perfectly for the rest of the day. Isn’t it fantastic I spend almost a whole day in there. I loved the “Top Hat” lampshades in the coffee shop, it is a place where you can truly lose yourself. What an absolutely amazing place! It’s quirky and interesting. And makes you want to look at every shelf in search of that book! I remember when I was growing up my grandma used to look after me when mum and dad went to work and she used to walk me to Wilmslow or the village as she used to call it. There was a book shop there and she always took me in. She’d sit me on the floor and put a book in my hands so I could ‘read’ it. I was only about 4. But this continued and even as I got older I used to love going on that shop…. No one would bat an eye if you sat reading for ages. I doubt that people would let you do that now! I still like a real book. I think it’s the smell and feel of the paper that makes it seem so special! I can imagine your face as you walked in there. I hope you get a chance to enjoy a good book very soon! What a fabulous place. I love reading and always have a book on the go. When I was little I went to the library every week with my mum but you had to be 5 to join. I was so happy when I reached that age and have been a member for 64 years. I remember taking out 3 books every week and worrying about what would happen when I read them all!! Nowadays I download from the library to my iPad but I still like a real book best and pick up books wherever I go. 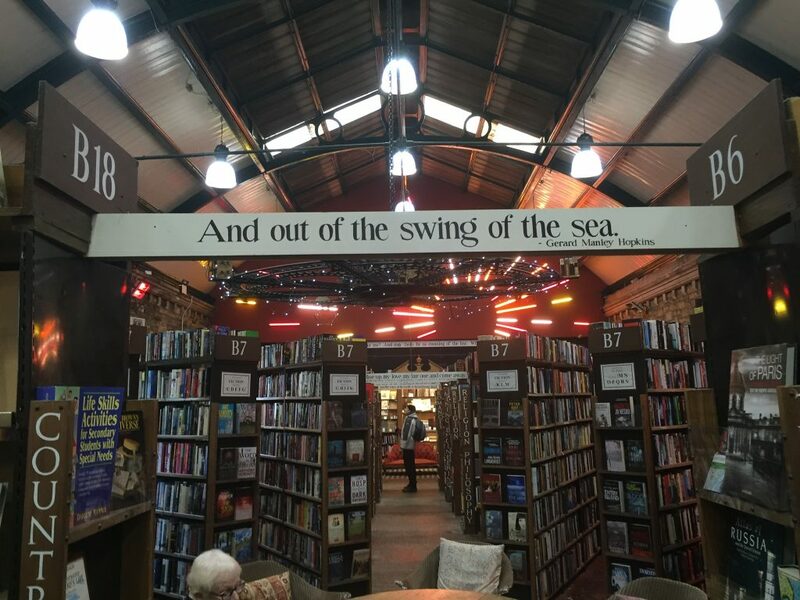 Barter Books is one of the most wonderful places I’ve ever discovered! It’s magical. So pleased you have found that gem in my part of the world – some time ago. It is truly remarkable. How right you are – nothing like a real book in your hand. Glad you had a good time – some call in God’s own country. My only pity is that I am where I am and not walking a Northumberland beach. What a lovely story and such an emotional and positive outcome for you from your visit. We have a similar bookshop in Inverness, Leakey’s Bookshop, which is in an old converted church. I love going in there, with it’s wood burner and sofas, and send all my guests. It’s a real experience, and I tell people a book will find them if they browse – it’s not organised enough for you to be able to find a book! I’m so pleased for you! When I had depression I read books which helped me forget for a little while why I was so sad. My children bought me a kindle paper white for Christmas as my sight isn’t great with small print of which I’m very grateful. 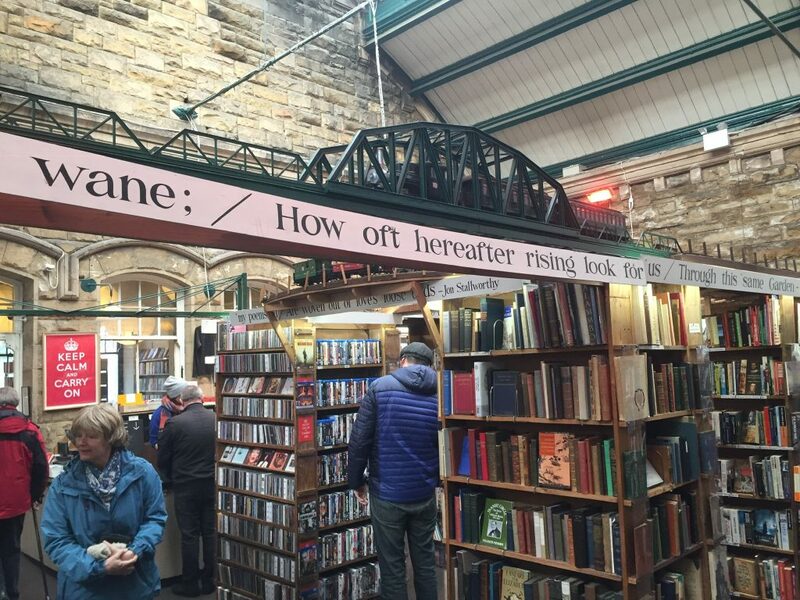 This bookshop is amazing. I first went over 20 yrs ago before it was updated, it was still fascinating and enthralling. I love the way it’s developed over the years into this bibliophile’s refuge, and always visit if possible when I’m in the area. WOW What an amazing looking place. I would get so lost in there. I just love a real book, there is something about the feel of the pages, the scent of the book and the ability to flick back and forth through the pages without getting eye strain. Books hold memories for me and I can’t imagine a world without them. The book shop is awesome isn’t it x I love reading and i have a kindle but I like the feel of a book too. The Northumberland coast and surrounding areas are beautiful.